Please note: the product featured on this page is not currently available through our suppliers. However, there is no need to worry! We wanted to continue to make sure these products are available to you, so we have partnered with another expert in the business. You will be purchasing this product through The Knot Wedding Shop and your product will be shipping from them. If you currently have other products in your cart here at Happy Is The Bride, then open this new window and complete your purchase with us, then come back and click the link on this page to visit TheKnot.com / Wedding Shop. We apologize for the confusion and any inconvenience. Feel free to contact us with any questions. Serve drinks with aplomb during cocktail hour. 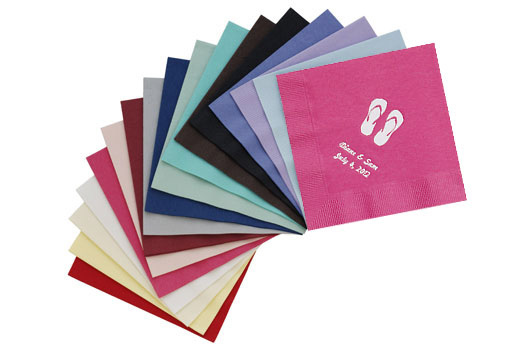 Personalize these cheery napkins with your names and wedding date or a special message with two lines of text. Choose one of each from: over 40 designs, 28 napkin colors, 3 type fonts, and 10 ink colors. Beverage napkins measure 5"x5" and are sold as a pack of 100. Also available in NEW Luncheon Napkins • 7"x7"